Many gardeners in the South have acquired the impression that perennial flowers in general are failures in south. This is in error and is due, perhaps, to our inability to grow just a few of the more important ones. It is true that some perennials such as delphinium and peonies, which require a long rest period with low temperatures, are failures in the Deep South. Our winters are both too short and too mild for them. But there are many perennials that thrive here. Just as many Southerners moving into the colder areas insist on trying to grow semi-tropical species in their new gardens, many families moving from the East and Midwest into the Deep South. They stubbornly attempt to grow the perennials that were mainstays in their former gardens. But all gardeners, sooner or later, discover that they must tailor gardening to match conditions. In the upper zone of the South most of the popular perennials will thrive, but as one goes deeper into this area, approaching the Gulf Coast and Florida, the list of perennials becomes more selective. But even on a limited list there are many fine perennials that will thrive in the mid-South and quite a number that will even do well in Florida. More than a score of heat-loving perennials thrive year in and year out, some of them requiring so little attention that spraying, dusting, cultivating and staking may be forgotten. Many are evergreen and their foliage provides a permanent feature in the garden scene. As any gardener from the colder areas where perennials are lavishly used will tell you, there are many advantages in using this more permanent plant material. Closely planted groups or masses of perennials give pleasing color effects and, when planted in heavy clumps in the shrub borders, lighten the whole area with color. Most of the perennials that thrive in the South are strong, husky species that are able to take considerable punishment. If grown for several years in one location, these plants usually establish strong root systems, enabling them to undergo long periods of heat and drought. Even with all the many virtues of perennials, we cannot hope to create the pleasing color effects achieved in the colder areas where perennials are used exclusively to form long borders. Down here better, more pleasing results can be gained by using perennials to supplement the annuals and to add variety in color, weight and form to the shrub border. Since we expect most perennials to remain undisturbed for a few years at least, a little extra attention should be given to preparing the soil and setting the plants. The beds for annuals are made for one season only, but those for perennials should be expected to last for several years before being remade. The soil should be spaded deeper than would normally be done for annuals (at .. least a foot) and a liberal amount of plant food should be mixed well down to the bottom of the bed. In the South most of our soils need additional organic material. A spread of 2 or 3 inches of cow manure mixed well into the soil will tend both to improve its texture and supply the needed nutrients. If manure is not available, use leafmold, peatmoss or other commercial humus, adding about 3 pounds of a high grade fertilizer for each 100 square feet of bed area. But whatever kind of plant food you use, be sure to mix it right down to the bottom of the bed; this is quite important as you need to encourage the roots to go as deep as they will; and the deeper they go the better your plants will stand the hot dry days ahead. Asclepias is a native which is finding its way into many gardens. The usual height is about 20 inches, the foliage is a bit coarse, but the flat heads of orange-red flowers are pleasing. It is exceptionally deep rooted and stands up well under the driest of summers. Baptisia, sometimes called false indigo, grows to a height of about 3 feet and has 6-inch spikes of dark blue flowers. Stands drought and heat well. Butterfiy-lily (Hedychium coronarium) grows to 5 or 6 feet, has canna-like foliage, and fragrant, white flowers which appear in late summer. It grows under normal garden conditions but will be happier with a bit of extra moisture. Cannas are popularity in the south is thanks to the dwarf varieties which are superior to the old tall-growing types. Give them deep soil, full sun and a little extra watering during the dry seasons. Chrysanthemums are one of our oldest flowers and are experiencing a revival of interest. The garden types will enable anyone to have a colorful garden for many weeks during late fall. Shasta daisies are too well known to require comment here. Many times these admirable plants die out after a heavy crop of bloom. In my experience, I have found that shade from other plants will invariably result in loss of the daisies. Give them plenty of sunlight and perfect drainage. Day-lilies or hemerocallis are perhaps the most popular of all perennial flowers in the South and Southwest, where they have proved highly dependable. The new varieties, new colors and ease of culture are making new friends for them everywhere. Eupatorium is a native to the South and is finding its way into many gardens. The profusion of small sky-blue flowers appearing on 2 to 3 foot plants in late fall is always welcome. It is quite showy and very easy to grow. 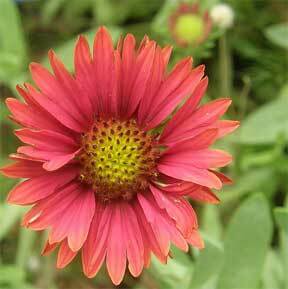 Gaillardia is fine for hot dry situations. Plants and flowers are almost identical with the annual form. Transvaal daisies (Gerberia Jamesoni) thrive right down to the Gulf Coast (they are a favorite in New Orleans) and deep into Florida. The plants form large clumps, are vigorous and deep rooted. The large, daisy-like, pastel colored flowers continue right through the season until killed by frost. Sunflowers (Helianthus floridanus), with 6-foot stems carrying lots of single, golden yellow flowers in October provide brilliant color in the fall. Though one rarely sees them in cultivation, they definitely do brighten up the border. They will grow almost anywhere. Lathyrus is the perennial form of the popular sweet pea. It climbs to a height of several feet and blooms over a long season. Requires no coddling. Physostegia can easily become a weed in rich deep soil, but the four-sided stems are interesting and the foliage lovely. Then in summer when the long spikes of lavender flowers begin to open, they are welcome in our garden. Iris have a definite place in Southern gardens: the bearded type does well through the mid-South; and along the Gulf Coast and in Florida the line natives, including the popular Louisianans, are dependable. Ophiopogon in its various forms is perhaps the most valuable plant for permanent edging available to Southern gardeners. It makes a year-round, neat edging that requires practically no attention. In addition to the several species with green foliage, there are also variegated forms. Phlox will thrive in every section of the South. In New Orleans the low growing, very early blue Phlox dirvaricata is a favorite; through the middle and northern zones the tall Phlox paniculam makes a line show in early summer; and Phlox Isubulata often wrongfully called thrift is dependable almost everywhere. Rudbeckia or golden-glow grows 3 to 4 feet high and its heavy crop of fully double, golden yellow flowers in late summer adds a light cheerful note to the borders. Gentian salvia (Salvia patens) reaches a height of about 2 feet and has ultra marine blue flowers, while Salvia farinacea grows to 3 or 4 feet, has silver foliage and lavender flowers. Both bloom over a long season. Stokesia or Stokes aster is a fine perennial and native to some sections of the South. It is low-growing, producing large aster-like, blue flowers over a long season. 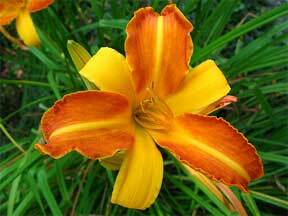 It is one of the finest companions for hemerocallis and will thrive in almost any soil, in sun or partial shade. In addition to those already mentioned, there are many native perennials whose beauty and ease of culture justify the extensive use of them in our gardens. 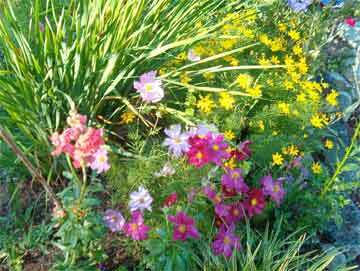 Among them are aster flowers, coreopsis, erythrina, liatris, rudbeckia (single flowered species) and tradescantia. Good article and so helpful as I have a beautiful perennial in Pennsylvania but we plan to move to the Gulf Coast of Florida soon. It is nice to know that I can take some of my old “friends” along with me.